Ingredients: Prep time: About 30 minutes. Wash beetroot thoroughly and cook in water until soft. Cut beetroot into slices or julienne strips. Place all other ingredients in a saucepan and bring to the boil. Keeps well in fridge for many months. 1kg (2.2lb) Small-medium sized raw beetroot. 300ml (10fldoz)White wine vinegar (or Balasamic vinegar). Heat oven to 180°C - 160°C (356°F - 320°F). Trim the leaves and most of stalks off the beetroot, leaving a stump of stalk on each. Wrap the beetroots individually in pieces of foil and place on a baking tray. Roast for 75 mins or until the point of a sharp knife can be easily inserted then leave to cool. Unwrap, peel and trim the stalks away from the beetroot. 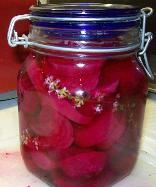 Leave the small ones whole and cut larger ones in half and pack them into a large sterilised jar. Tip the sugar, white wine vinegar, 200ml (6.8floz) cold water the spices and bay leaves into a sauce pan and bring to the boil.Turn down to a simmer and bubble gently, stirring, for 2 mins until all the sugar has dissolved. Turn off the heat and add the balsamic if using. Carefully pour the hot vinegar, spices and bay over the beetroot (you might not need it all) and leave to cool uncovered. Once cool pour the olive oil over, seal the jar and keep in the fridge for up to a month.